My holy grail of nail art! You guys, last December I have discovered something that has literally changed my life when it comes to painting my nails. All you need to do is apply your base coat and one or two layers of your favourite color just as you usually do (no need to wait for them to dry). 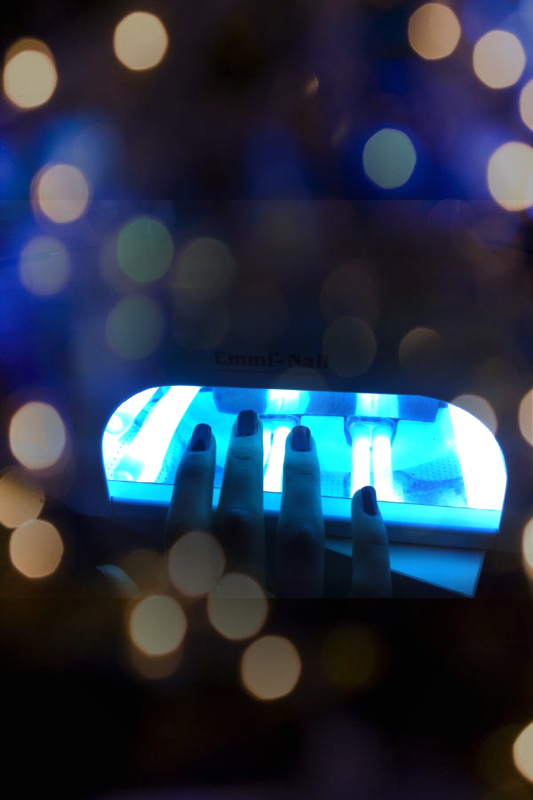 Then you cover the color with the top coat and place your hand in a UV nail lamp for about 5 minutes. Make sure not to look at the UV-light directly or use sunglasses to protect your eyes! Tadaa, that’s it! Go on with your regular life! From my experience I have to say that the top coat doesn’t really prevent the nails from chipping any better that other good quality top coats do… But it’s way faster to redo a chipped nail or your whole fingers now! From start to finish it takes me about 15-20 minutes. At first I was worried if the top coat would come off with regular nail polish remover… Guess what: it does! Yay! I got my polish at PrettyNailShop24 but I’m not trying to advertise their site or anyting, I’m sure you can get polish like that at various stores and nail salons. Still, this stuff is amazing!